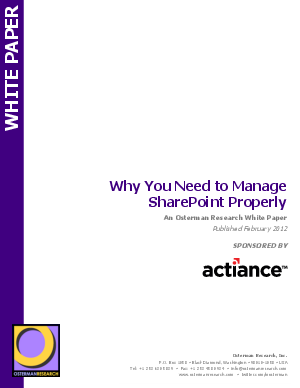 This white paper focuses on the compliance aspects of SharePoint and why it is important to incorporate complementary technologies that augment its native functionality. The paper also provides a brief overview of Actiance, the sponsor of this document, and its Vantage offering that provides compliance and management features not available natively in SharePoint. Managing SharePoint properly – through both governance processes and technology enablement – offers significant advantages. These include corporate risk mitigation and lower lifecycle cost for SharePoint in light of brand, reputational, and legal costs for failing to address these risks. Technology to enforce appropriate corporate policies and to adhere to regulatory and legal obligations must include three core capabilities: policy-driven, granular capture of content; real-time alerting to ensure that policy violations are detected and remediated as soon as possible; and contextual capture of information. Getting started with managing SharePoint properly is a four-step process: assessing the risks that apply to a particular organization, developing detailed and granular corporate policies, deploying technology to enable the enforcement of these policies, and reviewing the policies frequently in light of changing regulatory, legal, and corporate requirements.